The Vie de Chateau started. I am back to school after almost 11 years of free homework and no assignment. But this time I made it in style. I am living in an almost Chateau (Pictures to come), with 8 others students. We are as diverse as the school could be and represent 4 contiunents out of 5. My first week was really difficult because I did not use my brain for so long -some say that I don't have one, why bother- and staying still for our of lecture in a 70 or so classroom for hours is still a challenge right now. "No gain no pain" (in French in the texte) like my Boulanger friend said once. Last saturday we went in the Fontainebleau forest to do some team work. Sort of light army test where you have to walk blinfolded in the forest grabing some tools on the way in a team of 4, or climbing a rock only with your teammates help, or falling reverse from a man high hoping your new frend will save your life. It was totally insane, not because of the different activities (one month in any collective environment will fix your social bad behaviour), but because it rained 2 days before and it was hot the day before. I know that you dont really understand what I talking about, but if you were from the area you would know what it means. The forest was full of Cepes de Bordeaux. I lost it. Rather than participating in all these wonderfull activities, I was looking for the famous mushroom and could not do ANYTHING with. I could not grab them and cook them because we had a debriefing later on, and I did not had any bag with me (neither my teamates, what a team afterall !). What I did instead I took pictures of the different mushrooms, and I just took one, the most beautifull and smell it all day long. I was in pain no being able to collect them. 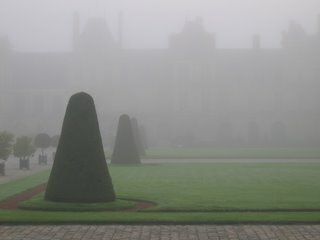 At one point a French family came over in my direction and ask me if I saw some, I honestly respond that I did not saw anything in the direction where I was coming from. This is not a lye, just a French custom of not saying where there are. 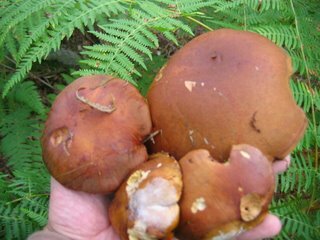 French are very concern with environment issue such as mushroom in the forest (in some in pacific as weel). At the night, during the debriefing of the day, I only thought of my mushroom and how I could go back next day, and what I am going to do with. I could not say to anyone that was a bad day for me, nobody would have understood why. I lye a second time and said that It was a fantastic opportunity to meet my teammate in such an extreme condition. The next day I try to look for them again, and I could not. Safe they thing there are, but next rain, I will be out there to look for them again, even if I have to make a fool of myself in class with my rain boots and my wet suit. You don't really know what I am talking about unless you had them once in yoiur life. This is probably what I like the most in France. I am rediscovering some of my favorites tastes, the ones that I forgot about. And I must say that they are very exiting in the real sense. 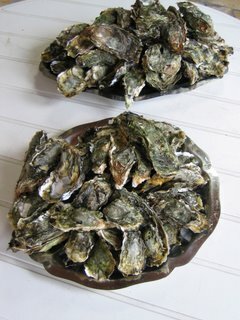 My first oyster was dedicated to M. because he ask me first, and my second was for K. But all the rest for me, and I enjoyed each of them. During my 2 weeks in Bordeaux, I spend most of my time eating cheese with wine and bread. I remember now all the different taste you could have. This was on these days that you remember for a long time. A day that remind me so much of what I liked in France, and a day that show me the bright side of the sun. 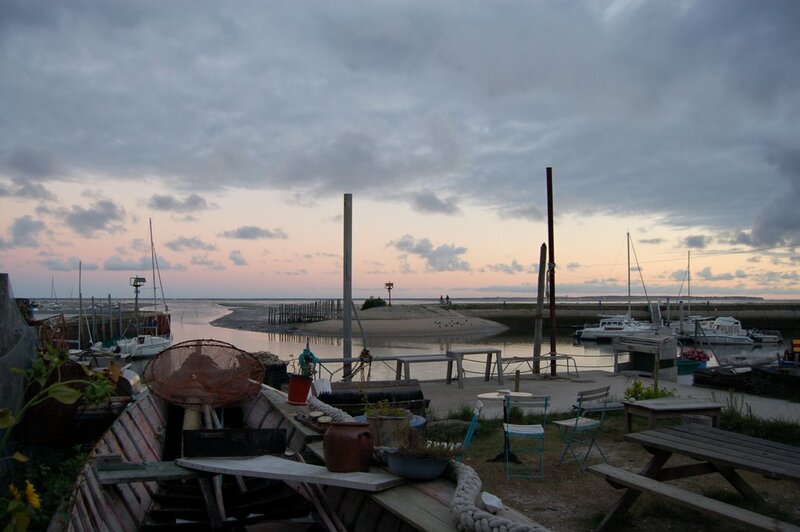 The classic question you are facing when you grew up in Bordeaux is "Are you Ocean or Bassin? ". 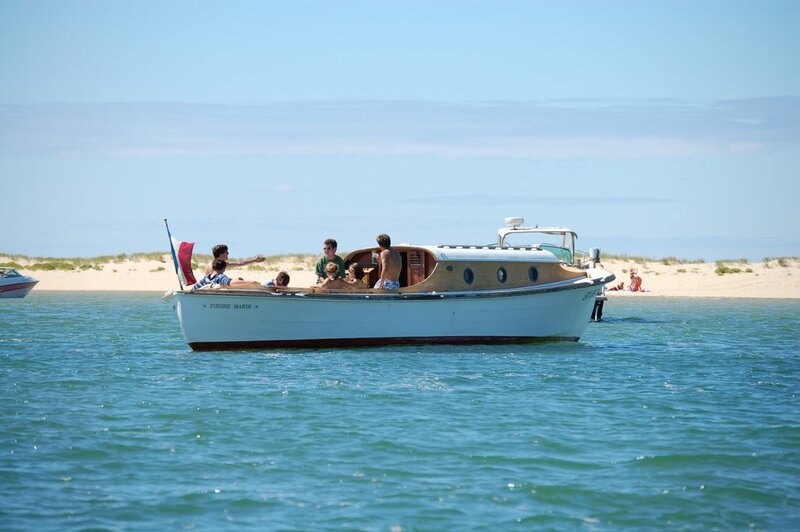 In plain English the question would be, Do you prefer going to the Ocean or going to the "Bassin d'Arcachon" (Arcachon Bay). All my life I did not know what to choose, someday I would prefer going to the Ocean over spending the day at the bay, but last Monday I really enjoy being a Bassin-lover and totally forgot about the big waves, sand, desert beach and chocolat-chantilly waffle you usually do, eat, watch when you dress up you Ocean-lover outfit. 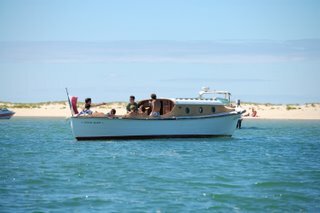 A traditional Arcachon Bay boat called "Pinasse". 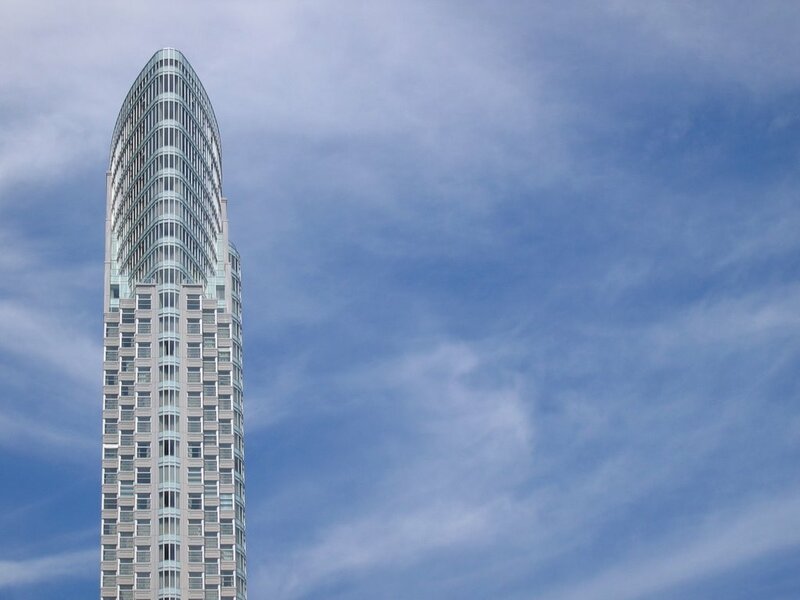 The bottom is flat to be able to go anywhere in the bay. Last Monday, Mum, Step-father and myself spent the full day at the Bassin. We took off really early that morning, 10 AM (afterall we all are in vacation), and drove in 2 cars to the Grand Piquey pier. At Claouey we stopped by and bought a whole chicken for lunch time. 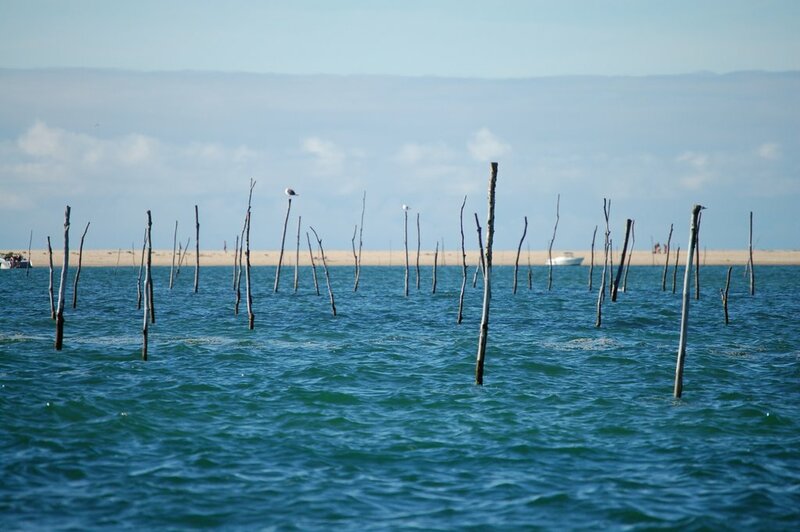 We reach the boat around 11:30 AM and started after some hesitation, floating to the sandbank of Arguin ("Banc d'Arguin"). The Oysters' parks under the water, and seagulls standing on sticks that delimiter the parks. The sandbank is in front of the biggest dune in Europe (Dune de Pilat) from which people do some hanggliding over the Atlantic ocean or one of the biggest forest in France (Forêt des Landes). The sandbank is moving from day to day and should be approached with care and localisation-efficient equipments (sonar, GPS tracker, maps). But the hard work was worth the price. We arrived in the middle of the inside of the Banc, and anchored the boat close to a swimming pool like area, blue lagoon, close to all the oysters' parks. We were only a handful of people on this massive desert sand island, and we had some space around. We eat lunch on the boat. The coffee did not challenge us at all and we crashed for a quick 2 hours nap, hearing seagull songs and the lullaby sound of the sea on the boat. The boat was big enough to handle each of us lying in a corner. It was probably there that I caught my sunburn, but I did not care, everything was just perfect there. I was happy to seat on a boat, smelling my sea and watching my ocean. I was just happy. After some laughs we decided to be a bit more adventurous and we all jumped in the sandbank. We crossed it and reached the ocean and the waves on the other side. We followed the seagull's footstep to the ocean and, like Robinson on his island, we saw the ocean with different eyes. The ocean was wild and virgin, just for us. We were the first human beings there. JL, my step father, realised after some baths and some more sun burning that we had to run back to the boat otherwise the tide would have forced us to spend an extra 12 hours. I did not mind staying there for an extra day, I was quite happy there, but we all rushed back. We spend 10 minutes moving the boat stuck in the sand, and finally put it back on track, if I could say. That was the only 10 minutes of exercices that day, but what a thrill ! 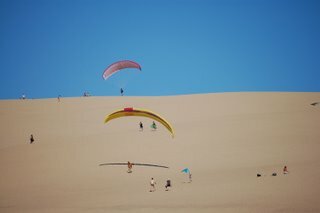 We flew back the few miles that separate the desert-beach-of-no-where called usually by the local Le Banc, to the pier in less than 30 minutes. Have you notice that if you want to be cool and local you just have to shorter all the names and you become just like them? 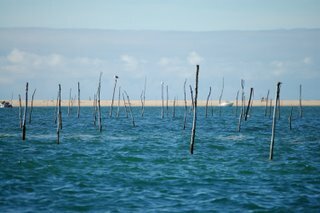 "Banc d'Arguin" becomes "Banc", "Bassin d'Arcachon" becomes, "Bassin" and "Bassin" becomes "Bas". Maybe "Bas" and could be change into "B", and "B" into " ". The view from my cousin place. Anyway, I am digressing, as usual, have you notice how easy it is to digress when you write a blog! In my case .............. but we reach the port at sunset, and took our time to adjust to the ground. The day full of sun and laziness was not over. 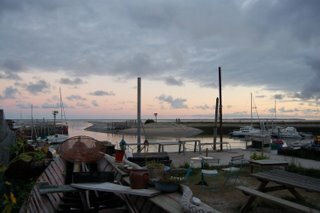 We drove back to the Andernos, to visit my cousin, oyster farmer. My sister M and her boyfriend O spend the last 2 hours trying to make him open his oyster-bar in front of the ocean at the end of the pier. He did not want to do anything still hangover from the night before at 5PM ! So we helped ourself and open all the remaining oysters, drank some white wine and ate some paté, while our cousin explaind to us his entire night in details. It was still sunset and the sky was pink. My happy day had a final point on it. I was delighted by the taste of the sea in my mouth. We drove back with my mum, not saying a word, and listening to Ayo, Down on my Knees full blast cutting the night with our salty memories. This was Monday 21st of August, and it was my Happy Day. When was your last Happy Day? Felow reader, I confess, I am a big fat liar. 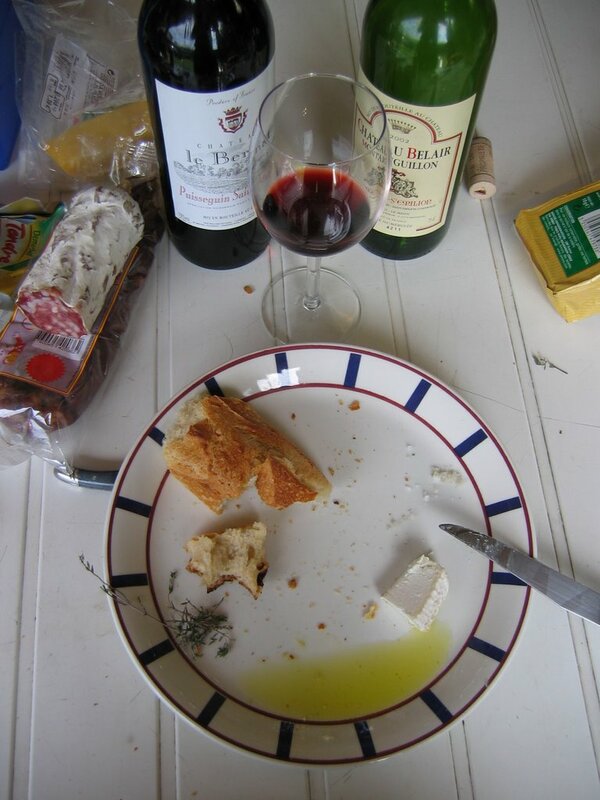 For the last 20 years or so, I kept saying to everyone I meet that I was from Bordeaux. But I am not from this city anymore, this is not my city! I know this is the classic cliché of an old man going back to his old town, saying old things to young people; but places that I knew are not there anymore, and places that still exist are not the same anymore. 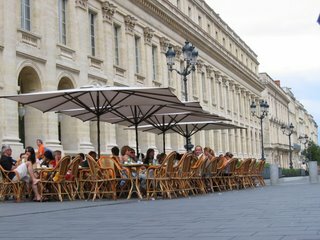 What I liked somehow in this city of Bordeaux was the constant continuity of the continuum space-time dimension, you could go back anytime, anywhere and you were sure to find the same old café, with the same comptoir, with the same garçon, with the same mirror behind him. Not anymore ! Downtown is now an all pedestrian compilation of streets full of brand new bars and brand new restaurants. 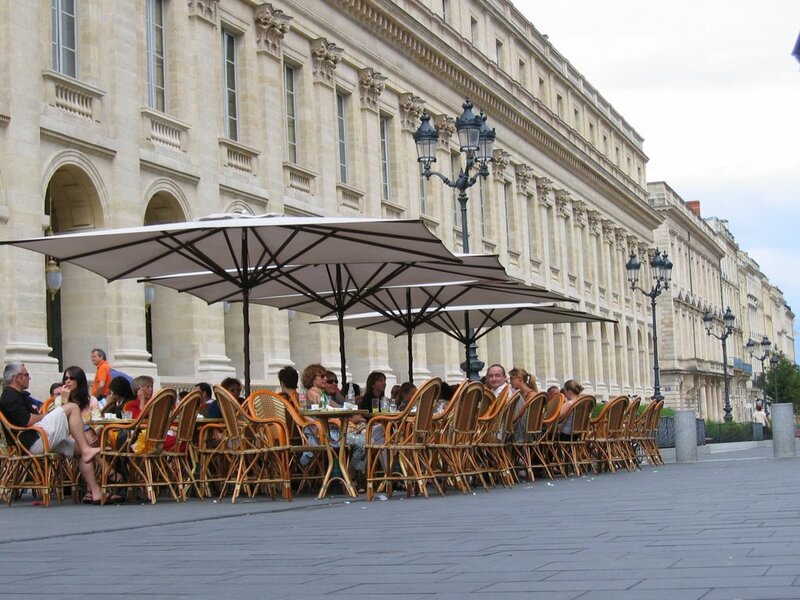 The quai have been restored and are now an amazing alley to wonder around. The other side of the river, once consider the worse place to living in, is now the best spot in town to appreciate the fullest of one of the most bourgeois city in France. Bordeaux once called the sleepy beauty, eat the apple, has awake and is standing still, kicking and alive. I am happy for EVERYTHING. 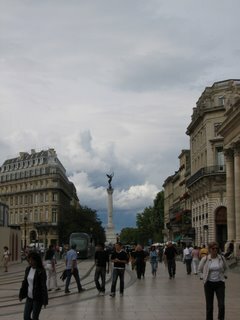 This is the Statue des Girondins from the Grand Theatre. You can see the new streetcar on the left side, totally electric so silent. 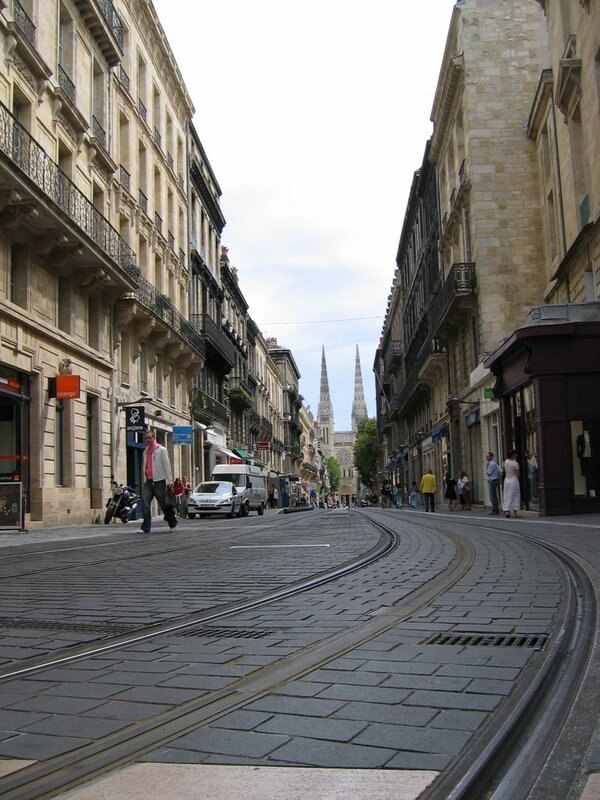 Streetcars had to make noises to avoid accident, so it has been decided that the streetcar is going to make the exact same noise as the one that Bordeaux had 50 years ago. Of course you have a terrasse close to the Grand Theater, where people watch people passing by. This national sport is becoming easier since that the entire area has been shut down of engine and becoming a pieton area only. This is the tram rails, with a view down to the Pey Berlan place. 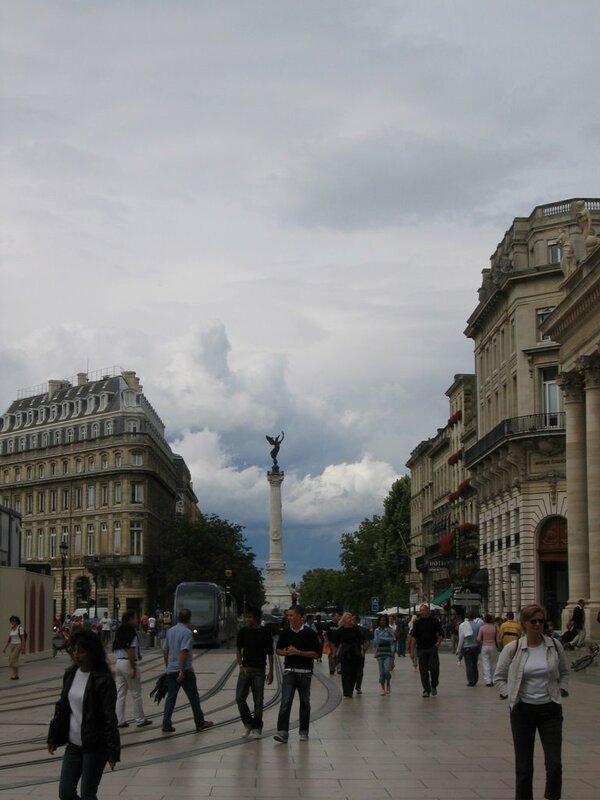 None so far, but Bordeaux is a paradise for camera addict. I will add some pic as soon as I can, using my sister brand new camera. The first thing that I notice in Toronto after travelling for so long in South America is the absence. The absence of aggresivity. I could just walked in the city and lifted my weight of constant pain. I could walked around without thinking twice about what could happen to me. You always see the place you are in with the eyes of the place you just left. And for me I was seeing the place with South American eyes. I was natural in the city again. 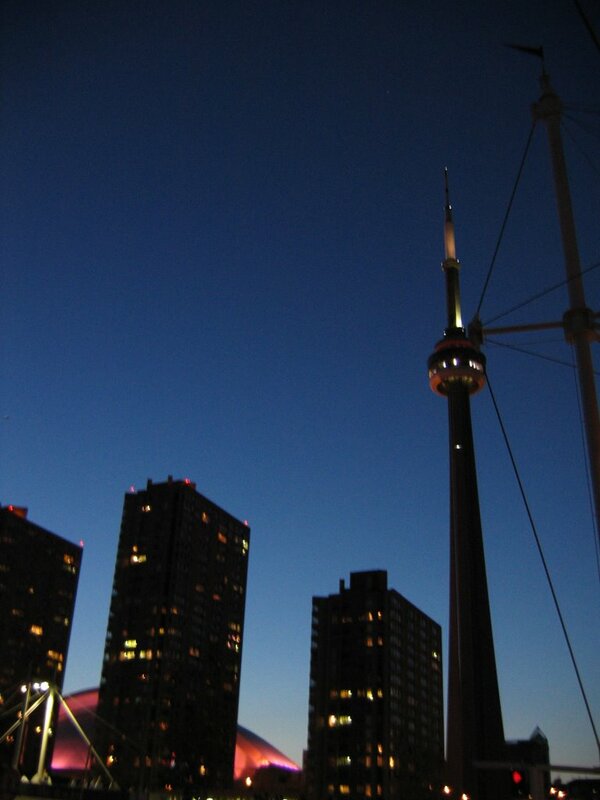 Toronto became instantanitly my city, the city that I lived in for many years now. My moving around was very fine yet tourist. I forced myself to stay in a hostel in Kensington Market, and such for 2 reasons; the first one because it is a central place in Toronto, and the second because it is one of the Spanish place in Toronto. I was having a central decompression sass for the few days I was staying in Toronto in my in-between time. During my short stay in this city I tried to do all the thing I must have to do before leaving, and sadly enough I just manage to do only few of them. I am really sorry to not had the time for all the people that I know in Toronto and I did not see, but know for sure that I keep a big place for all you in my small heart. For all of these reason, I love Toronto. Toronto is a beautiful city ... in the summer time. When I look back to the last 3 months I just spent, I can say that I was very lucky. I had a great time traveling around, meeting people and more importantly had a chance to be in places that helped me think to be different. I know when you think you don’t usually do, but in my case I did do a lot of thinking. One should have some time off in his or her life to be able to do the thinking and then think the doing. Let me explain you why I was lucky. I traveled in the North part of South America in places where usually people don’t go because they prefer spending times in more casual destinations. I do agree on that statement and used to think that way, but this time I try to push a bit my boundaries and change my references for a change. I was lucky to be different. I was lucky to be by myself. Backpacking by yourself is a thing that should be done only in good company. And I liked being lost in places without having the possibility or the opportunity to communicate. Some people could not spend an hour without talking. I was happy to spend days without talking to anyone but to myself. Of course I had to speak to people and chitchat with them on some casual thing, like bus schedule or food menu or place to sleep, but I could not elevate my casual talking to something more profound due to my lack of motivation or lack of language domestication. I spend most of my time in this state of mine, yet I was happy and looked for it. I did not had any trouble in crossing all these countries. Of course I had some issue here and there, but nothing special. Most of the things that I took with me the first day were lost / stolen / given by the end of the trip, but I had nothing wrong happen to me. I was the witness of more serious thing, like robbery or mugging, I heard story from people who were robbed, mugged, kidnapped and rapped. I saw dead people on the sidewalk and I manage to go through without any issue. My lucky star was taking care of me during this trip. When I think about all the things that I traveled through, I would say that the 2 things that I still can remember vividly even today are the Machu Picchu in the early morning and the bay of Rio de Janeiro at the end of the afternoon. Macchu Picchu in Peru, for me is the time when I saw enigma. Nobody knows why this place exist, but it is still there between earth and sky, floating in the clouds. 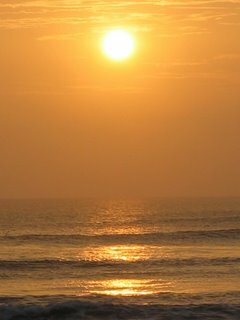 The bay of Rio de Janeiro in Brazil, for me is the time when I saw magic. Nobody can appreciate more Rio than from the Christ (Corcovado). These two places are now in my heart and in my dreams for the rest of my life. I was lucky to just see them once in my lifetime. I am glad that I traveled to be there. Out of the 1200+ photos that I took in my trip I had to select a hanfull, and that was my task of the last 2 days. I finally made a short cut of what I like the most. Hope you will enjoy them as well. Brasil, Ecuador, Peru and Bolivia are now accessible in Mintalo. "Democracia es pan con libertad!" Espero que podria visitar le de nuevo un dia. In few hours I will take my flight back to TO, and in the meantime I am surfing on the net trying to catch on the world like a maniac. I missed so many thing during my time off travelling in South America that it will take me more than few hours to go around. By the way, I would greatly appreciate any king of fast crash course to go over some of the most important thing that went by during the last 3 months. - Europe had a hot wave, as well as North America. - A war started in Middle East. - Asia had few crisis, India some bombs, and Africa try to elect corrupt people. - Few presidents were elected and some were dismissed. - Cuba almost change, but manage to be the same, for now. - My soccer team did not buy any players yet start with a win last saturday. One thing that did not change that mush is the city that I started few months. Lima is the same as I left it. The thing that actually change is probably me and my backpack. I almost lost /give everything or had some of my stuff stolen all along the way. I also bought so many thing that nothing is the same in my bag. This is what travel is for in fact, unload your bag and load it with some new idea. I will need some time to go over all my pictures, upload the best shots online and for sure think about everything that happen to me in these last few months. I am in a certain way sad because my trip in South America is now over but I am really happy to go back to TO. I will have a long hot bath and a green salad tomorrow and that will make my day. In Lima everything could be stolen. So in restaurant, all chairs have their own purse-lock on the back of them. Weired but it´s working. My last cab ride from the hostel to the airport was quite a ride. I was driven by a cocainoman cab driver and we drove the 20 Km in less than 16 minutes. At one point, between bumps and holes, we took over a bus that was taking over an other cab and having a car in front of us in a 2 lines road in the midle of the night. I was praying beleive it or not in Spanish. But we made it largerly in time for the line up at the one Air Canada counter. Safe and in one piece. I bought my ticket to go to Huaraz, and 2 days later I find out that I would fly out of Lima 24 hours sooner than what I was thinking. That would have left me with only 24 hours after a night bus trip, to see the entire city and all the different sites around, with a big risk of not finding a bus ride to Lima later on. The only thing I saw, then, of Huaraz is their website ! I gave up on one more 10 hours night bus trip and book instead a 10 hours day bus ride to Lima to arrive safetly to the Hostel I started almost 3 months. Same crowd, same music, same place and almost same stories. It feels good to be back home, in nowhere. I was in a long bus trip, and after 12 hours my neigbourghs were very tired spending most of the trip managing the 5 years old girl running around, trying to occupied her most of the journey. At the end of the trip, while leaving the bus, the 5 years old kid complained about her evil mother and she said very loadly so that the entire bus could heard what she had to say: "Yo soy un esclave de mi Mama, porque no puedo ser libre!" 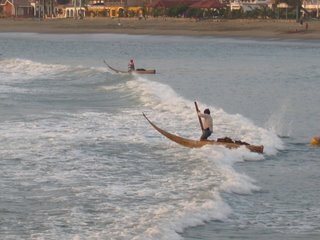 The city of Huanchaco is 12 km away from Trujillo, and is main surf spot as well. But what was interesting was the way fisher man do they job. They use the same boat as the Moche use to. 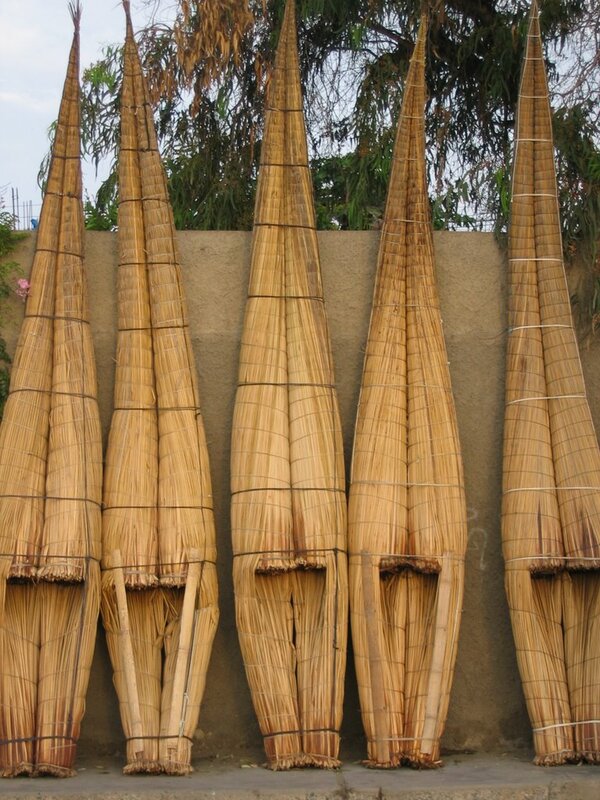 It´s a long strange thing called Caballito de Totora and is made in Tortora. Don´t ask me what it is I have no clue. But it is really solid and very efficient in the local big waves. At 6PM at sunset, all of them go out in the bay fishing for the restaurant. You can not say there that the fish is not fresh. You probably order your plate, see the guy going away, and then see him cathcing it. It ws quite interesting to see how they move over the waves. The funning thing was that at the same time we had a surfing lessons for some loud German on the side. They were not that good at standing up on the long board. 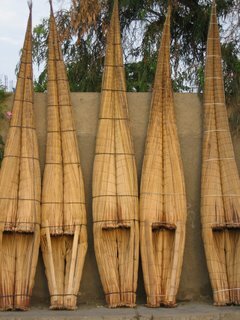 But our local surf boat went trhough like a knife in a moutain of mantequilla.